Duggie's career in show business began early, as a boy aged about 11, when he appeared in the Robert Donat feature film The Cure for Love. He then went on tour with a singing group called The Four Blue Pages, all young lads, until his voice broke. From this, he turned to comedy, working the Variety circuit and performing regularly on numerous radio shows; his debut being on Variety Playhouse. For years he was prominent in Summer Shows and in pantomime, where he often played Dame, until he formed his own company in the 1960s. This proved to be highly successful and his own pantos, summer shows and plays were hits in numerous theatres countrywide, many of them touring abroad as far afield as Scandinavia, South Africa and the U.S.A..
Chapman's Music Hall was a notable production in which he often played The Chairman, and his World War 2 nostalgia show We'll Meet Again packed 'em in for years. He was very much the old style impresario, totally steeped in show business; a walking encyclopedia of knowledge when it came to all aspects of entertainment. An ultimate figure in production, he also never stopped performing, loving one aspect as much as the other. Later film appearances included the Blackpool based cult film classic Funny Bones, starring Jerry Lewis. He also featured as The General in the BBC film Florence Nightingale. As well as giving constant work to hundreds of pro performers, Duggie was also highly respected as a true gentleman with an honest, caring and generous nature. 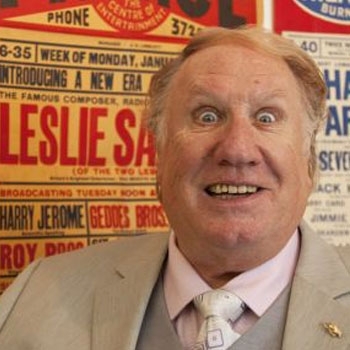 In 2009 he received an MBE from Prince Charles for his services to Light Entertainment and Charity.